NOTICE 2018-08-01: OKex API has been taken down until further notice. OKex and Huobi are too major players in the Asian region for cryptocurrency exchanges. Both produce stellar volume, making it a great place to trade cryptocurrencies in high frequency. With hundreds of pairs, it sometimes makes it hard to track everything that’s going on in the exchange, that’s where Cryptolume with it’s cryptocurrency alerts and trading tool comes in. 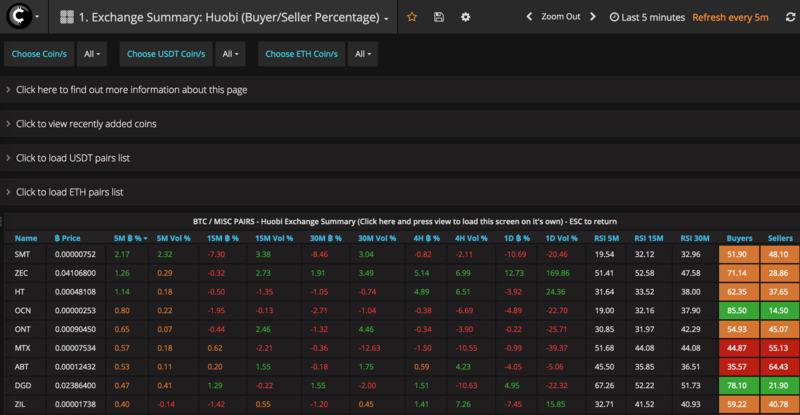 With Cryptolume, we tap into the API of both Huobi and OKex, to be able to compute data coming through them and provide algorithmic trading alerts and analysis to our users, we do this through our own internal calculations and are able to provide alerts on indicators such as RSI, MACD, MACD Crossovers, Volume/Price and more. Below you’ll find a bit more information and screenshots on exactly what we can do. 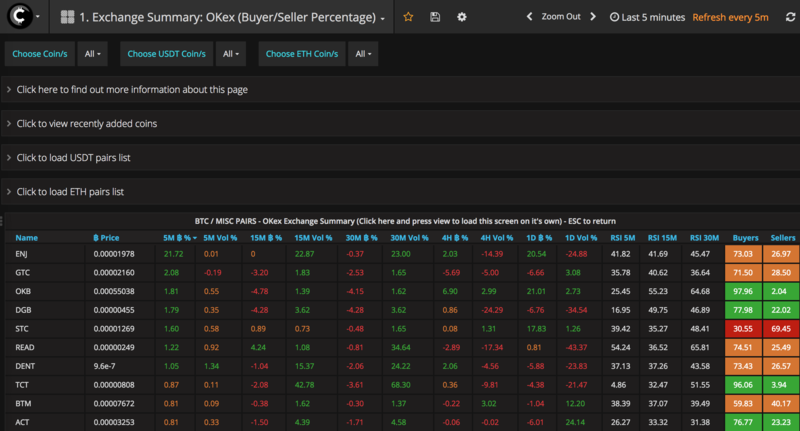 The exchange based summary is a great tool, that allows you to see timeframes instantly, all on the same page for 5M, 15M, 30M, 4H and 24H candles. Soon we’ll be implementing 3 minute candles for high frequency trading. As you can see above, you can see pairs for USDT, ETH and the standard which is open by default (BTC & Miscellaneous pairs). 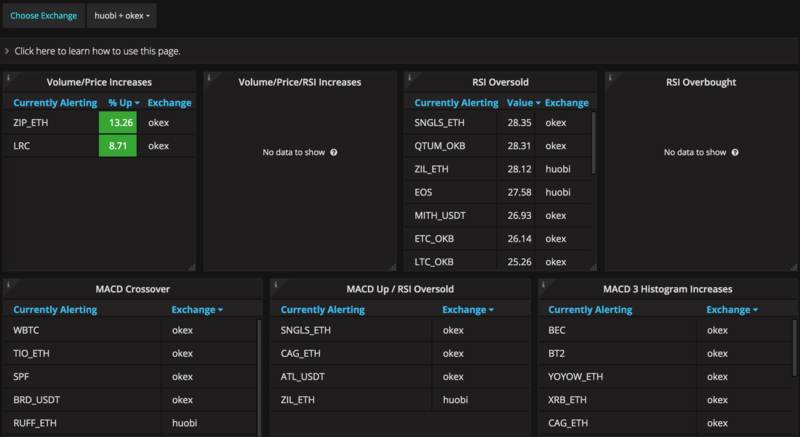 You can also track RSI values instantly on this page, as well as see the current order book statistics. This is a great way to save heaps of time on your technical analysis in trading and get ahead of the game. As you can see, there isn’t much difference in terms of the interface on both these exchanges, and it is much the same across the rest of Cryptolume. We’ve made the UI as user friendly as possible. The below, is an example of OKex + Huobi both selected to receive alerts on our platform, which works the same way as a traditional stock scanner. Why are coins being added to new exchanges so important? This is mainly because of the price action that’s involved when a cryptocurrency enters an exchange, especially if it’s a high volume exchange or a coin that had it’s ICO sold out almost instantly. Traders can see returns as high as 100%+ within minutes on these types of trades if the right analysis is done beforehand. All these tools and more are available within Cryptolume, if you would like to find out more click here to visit our homepage.